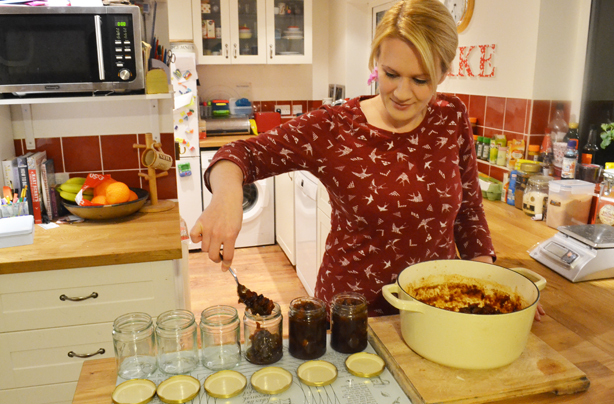 We’ve challenged mummy blogger Anneliese to have a #DIYChristmas, making all of her Christmas food gifts from scratch. Will she manage it, and how much will she save?! Anneliese has certainly got her work cut out this Christmas, making all her foodie gifts from scratch, from stollen to biscotti, from shortbread to peppermint creams. Every week, Anneliese will be rolling up her sleeves and making some of her family’s festive favourites. She’ll be sharing all her tricks and tips when it comes to making homemade food gifts, how to organise yourself, where to store everything, how to gift wrap it all and most importantly, how to do it all on a BUDGET. Week four: Christmas presents – sorted! In just a few days it will be Christmas and I’m frantically baking the last few homemade treats! I wish time would slow down as there is still quite a bit to be done. Of course, my children have no such concerns and Christmas can’t come soon enough! Their countdown started in October, so it’s safe to say that they are full of excitement now that the long wait is almost over. For the past three weeks I have been baking my way through a whole host of festive recipes. Our kitchen worktops are laden with an array of mini Christmas cakes, bags of sweet treats and jars of jam and chutney. In the fridge is a delicious stash of salted caramel sauce and the freezer is crammed full of goodies. All of this food on display has proved difficult to resist and, of course, it is my duty to exercise quality control. I’ve helped myself to the odd piece of honeycomb, a sample of fudge and a sliver of Stollen; as a result my trousers are exceedingly tight! When I started my #DIYChristmas challenge I was full of excitement. I couldn’t wait to get in the kitchen to bake gifts for my family, friends and my children’s school staff. However, this adds up to a lot of people and it’s easy to forget that all the gifts need to be packaged neatly. The recipes I chose were pretty good value, especially as I didn’t use premium products. However, the packaging is what hiked the prices up. I did attempt to make some packaging myself, such as cute little paper cup boxes and a clean Pringle tube for cookies, but anything more proved too much. Christmas is such a busy time of year, so it was hard to find the time and energy to make the packaging too. I’m sure there are some who are able to achieve this but I certainly couldn’t! I was more than happy to buy cupcake boxes for the 28 mini Christmas cakes and cellophane bags for my sweet treats. I’m really happy with the little hamper baskets and the cute wooden crates; they are exactly what I wanted. However, at around £5 each it added up very quickly! As I planned ahead and knew exactly what I would be making, week on week, I didn’t feel particularly stressed during the course of this DIY Christmas challenge. In fact the first few weeks were a fairly leisurely affair! During the first few days, I enjoyed making jam and chutney, along with mini Christmas cakes. Biscotti keeps very well, so they were next on my list. I made a batch to store in an airtight container as they will keep for up to four weeks. I’d never dared to make Biscotti before but it was actually really straightforward, so I’ll be making them again soon! It wasn’t long before I started making use of my freezer. Bakes such as Stollen and cookie dough are a good choice to freeze, so long as they are well wrapped and un-iced. There is also a large quantity of gingerbread dough ready to be turned into a house and gingerbread men. The white chocolate and cranberry cookie dough is already frozen into balls, so will be cooked straight from the freezer. Once my freezer was full I concentrated on making sweet treats such as orange candied peel dipped in dark chocolate, honeycomb, Bailey’s fudge and chocolate bark. I found some silicone festive moulds in the pound shop and used them to make Florentines. The Christmas tree mould worked the best. I’m so pleased with how the little Florentines have turned out; they look so cute! For last minute treats I’ve made some Christmas pudding bites. I used my usual brownie recipe to make these. I had expected to need chocolate buttercream to bind the brownie crumbs into balls but there was no need for it. After covering the brownie balls in milk chocolate and a drizzle of white chocolate, I used some lovely holly and berry sprinkles for the decoration so I didn’t have to bother with messy fondant! I put an unused silicon macaroon mould to good use to make giant white chocolate jazzies. These will be well received by my husband who is a big fan! Top tip: Keep your food gifts simple, less is more! Of course no child’s Christmas would be complete without the inclusion of reindeer poop!! I promise that this is not as disgusting as it sounds! To make my own all I needed were some raisins and melted chocolate. My five year old saw me making them and enquired as to what I was doing. His little face lit up with glee at the fact that Mummy was making reindeer poop. I’ll never understand! Of course there are a few days until Christmas and I still have a few things left to make. There are the cheesy biscuits which will be perfect in the hampers, and also raspberry and passion fruit pastilles, if I can find decent raspberries out of season! I’ll be turning brownies into little Christmas trees for the children and making cookie mix in a jar for several friends. As long as I pace myself I should manage to have everything completed for the big day. Phew! This challenge has been time consuming but thoroughly enjoyable. However, I did spend more money than I had anticipated. Although I didn’t splash out on expensive ingredients I did fork out quite a bit of money for all of the packaging I required. The packaging seemed never ending; not only did I need cake boxes, hampers, cellophane bags, gift labels and ribbon, I also needed gift bags to transport the home made gifts to school or in the car to family and friends. It’s also pretty soul destroying to spend time and money making something from scratch only to see that it can be bought in a shop at a bargain price! Of course it would be much easier to pop to the shops and fill the shopping trolley with perfectly decent treats but I would still rather make my own. Despite all the mess, expense, time and energy put into making homemade gifts, I feel it is completely worthwhile. What is better than receiving a jar of homemade chutney or a lovingly prepared Christmas cake? To make gifts for my family and friends hopefully shows just how special they are and that, to me, is priceless. Make a list of everything you wish to make and when you need to make them. Cookie dough and gingerbread dough are great to freeze. Un-iced cakes such as brownies can be frozen so long as well wrapped to avoid freezer burn. Even if it’s Christmas Eve, there’s still time to make some gifts. Chocolate bark is just a case of melting chocolate and then sprinkling over such things as freeze dried raspberries, marshmallows or crushed candy canes. Whip up some honeycomb, break into pieces and package in cellophone gift bags. If you have time get creative and make some packaging to add to the personal touch. Paper cups make great little gift boxes, while clean Pringle tubes are perfect for your homemade cookies. Making homemade gifts should be fun, so don’t overdo it. Friends and family will be delighted with the smallest offering. This week of my challenge has been a gentle and calm affair. I’ve been able to tick a few more bakes off my list and I’ve also started planning the packaging for my homemade gifts. There has been no rushing to get things done and I haven’t needed to bake into the early hours. I feel like I’ve been lulled into a false sense of security! The next few weeks will no doubt tell a different story as I’m not even half way through my lengthy list yet. It doesn’t help that the calendar is full of Christmas activities, so there’s every chance that I’ll find myself in the kitchen in the wee small hours! I shall continue to tell myself that it will all be worth it! 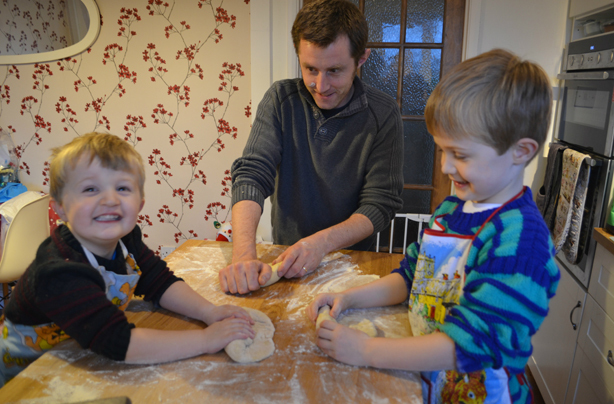 Top tip: Get the whole family involved in making food gifts, it’s fun for everyone! This week I’ve been baking treats for the freezer. To attempt this after a rather large food delivery was, perhaps, not the best idea as the freezer was fit to burst! First on my list were white chocolate and cranberry cookies. I’m not sure if cookies are particularly Christmassy but hopefully the dried cranberries give a nod towards the festive season! The recipe was really easy to ‘throw together’ and, within five minutes, my cookie dough was ready. I shaped the dough into balls and even went as far as weighing them. I wouldn’t usually go to these lengths but I wanted all the cookies to be uniform in size so they would fit neatly into my chosen packaging. I froze the cookie balls on a baking tray and then, once frozen, I placed them all into a freezer bag. I will bake them, straight from frozen, a few days before Christmas. Gingerbread dough was the next item destined for the freezer. I’ll be making a ‘flat pack’ gingerbread house and some gingerbread men, so I decided to make a double batch of the recipe. I may well end up with too much, but I don’t necessarily see that as a bad thing! After making the large quantity of gingerbread dough, I divided it into two, one portion for the house and the other for the gingerbread men. I wrapped them in cling film and into the freezer they went! Top tip: Clean Pringles tubs make ideal storage for cookies. Wrap in festive paper and tie with a bow! After rearranging the overflowing freezer, I found enough room to fit in a brownie traybake. When I defrost the brownies in a few weeks I will use half to make Christmas trees and the other half for Christmas pudding bites. I really hope they turn out as cute as I picture them in my head! The last bake of the week I left to the rest of my family. Neil, my husband, wanted to join in and make a homemade gift. He has started a tradition of making Stollen at Christmas, so it was only natural that he chose to make it again but in miniature form. There has to be enough to go inside several hampers, so he would be making six mini ones. Bravely he chose to make the Stollen with our two young boys. There was some arguing over the spoons and both boys managed to fall off the chairs they were standing on but Neil managed to maintain some sense of order and the three of them produced some fantastic Stollen. It smelt heavenly as it baked in the oven and it seemed a shame to place it into the freezer without a taste, so we pinched one and shared it between us. Oh so good! 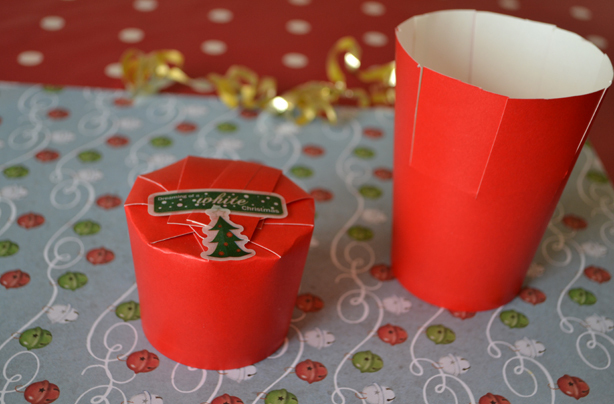 Top tip: Turn a paper cup into a small gift box – it’s simple! This Christmas baking is all very well and good but I also needed to look into my packaging options. I wanted to practise making a few things myself to add to the personal touch. Although I also searched online and bought several hampers and wooden crates, I opted for simple basket hampers without a lid; I can wrap them with cellophane and a big bow instead. The shallow crates are for the children and I’m sure they can be re-used to store their toys in once they’ve eaten all the treats. I kept to around £5 for each which I didn’t think was too bad, but that was until I added them all up and realised I’d spent nearly £30 on the packaging alone, argh!! After suffering the dent to my bank account I decided that I really did need to make as much packaging as I could. I practised making little bags with Christmas themed paper. I used a cookie cutter to cut out a shape from the centre of the paper and then placed a cellophane bag filled with sweets inside to show through the cut out. I haven’t made the fudge or other sweets yet so had to improvise and practise with some mini Easter eggs I’d found at the back of the cupboard and some biscuits! Although the paper bags were cute they were not quite tall enough. They would have been sturdier if I’d used thin card. So back to the drawing board! I need some packaging for the white chocolate and cranberry cookies, so Neil and I selflessly polished off a tube of Pringles solely for this purpose. I wrapped the tube in Christmas wrapping paper and added a bit of ribbon. It turned into the perfect vessel for cookies, hooray! I can’t wait to bake the cookies and see what they’ll look like inside. Top tip: Use cookie cutters to cut out shapes on festive card – these make perfect packaging! I will be making peppermint creams for my parents’ hamper and, after spending ages pondering what I could display them in, I think I’ve struck gold! A simple paper cup with slits cut down the sides. When the slits are folded in and slotted together it makes a perfect container for little treats or perhaps even a cupcake! I know that I do not have the time or patience to repeat this 28 times for my mini Christmas cupcakes so I turned to Elite Packaging! The lovely individual cupcake boxes are great quality and cost just 50p each. This means that each cupcake gift will cost around £1.50. This includes ingredients for cake, simple decoration and the packaging. They will make such a lovely gift but at a reasonable price. I have lots to contend with next week. I’ll be making biscotti and salted caramel sauce for the first time and also some Bailey’s fudge! I will also need to finalise my packaging. Will I be able to make more of my own or is it just easier to visit the shops?! Week two: Money, money, money! I’ve completed the first week of my homemade Christmas challenge and I have been busy conjuring up some festive treats. Christmas may still be a few weeks away but now is the perfect time to make the gifts that need time to mature. Mini Christmas cakes were first on my list and I relished making them; the smell was divine! I baked 28 cakes in cute baking cups. These cakes will be at the centre of most of my gifts; they will go into hampers for family, staff at my sons’ pre-school and school and to several friends too. I still need to decorate the cakes with a layer of marzipan and fondant decoration, but they are good value. It’s also a great time saver as it only requires one baking session, but will serve so many people! Top tip: If you’ve got a lot of people on your Christmas list, make everything in batches and freeze them! I was keen to make a few jars of jam for hampers – I initially thought of making a raspberry or strawberry jam but as they are no longer in season, it would have worked out to be expensive. Not one to be beaten, I looked for an alternative and came across this recipe for Christmas jam. Perfect! The jam contains fresh cranberries, which are now easy to find in the shops. They did not come cheap but were far more reasonable than the other berries! This jam was really easy to make and is a pretty, Christmassy red. It actually made more jam than I was expecting, so that means I can give away extra gifts and keep a jar back for ourselves. They will be perfect for my hampers, but I still need to remember to get some labels for them! Top tip: Homemade jams or chutneys can be made well in advance which will mean less rush before the big day! Of course, no hamper would be complete without a jar of chutney, so this was something else to tick off my list this week. We had been given some cooking apples from my in-laws’ garden, so this was the perfect opportunity to use them up. It also meant that it was a very economical addition to my Christmas gifts! It took a while to peel and chop up the apples, while the onions caused tears to roll down my cheeks. Neil saw my plight and took over chopping duty but due to my blurred vision, I read the recipe wrong and he ended up chopping an extra 600g onions! Thankfully, I was forgiven as the excess could go into the freezer for another day. It was really satisfying making the chutney as it’s not something I’d usually make. However, our entire house now reeks of vinegar! I intend to make good use of our freezer over the course of this #DIYChristmas challenge. Most cakes and biscuits will only last a few days after they are baked but they can often be stored in the freezer for at least a month, minus icing. With this in mind, I whipped up a sticky gingerbread loaf. It smelt amazing and it was hard not to dig in and cut a slice. However, I resisted and wrapped it well in greaseproof paper and foil before tucking it up into the freezer, where it will stay for the next few weeks. Just before the big day, I can defrost it and make an effort to package it nicely for my brother-in-law, who happens to be a big gingerbread fan! Top tip: If you’re using jars to store food gifts, make sure they’re clean beforehand. Here’s how to sterilise them! I’ve enjoyed getting into the Christmas spirit this week and feel as though I’ve made good progress. I didn’t have to buy a huge quantity of ingredients as quite a lot was found in my storecupboard. The gingerbread cake and chutney were the best value, especially as I didn’t have to buy the apples. Of course, the cranberries did dent my budget and dried fruit can add up quickly too. When you make your own gifts, you also have to take the packaging into consideration. I did buy new jars for the jam and chutney, but they worked out at under a £1 a jar and I’m happy with that. The baking cups for my mini Christmas cakes came in at 12p per cup and really were a great buy. Not only are they pretty, but they keep their shape and colour in the oven too. Next week I’ll be putting my freezer to good use again as I get ahead and make cookies, stollen and gingerbread dough. I’ll also be looking into packaging and having a go at making my own. This should prove interesting as I have very limited presentation skills. Eek! Sticky gingerbread loaf = £1.02 Mini Christmas cakes x 28 = with baking cups 47p each. Without baking cups 35p Mini Stollen x 8 = 57p each Christmas cake pops = £2.35 Shortbread biscuits x 8 = 6p each. Christmas is such a special time of the year; tinsel, pretty lights, family and friends and of course, the food! Choosing gifts is a big part of the festive season but it’s easy to go overboard and to spend more than intended. Hours can be spent pottering around the shops or searching online, but it can make it very hard to find that perfect present and it’s even harder to add that personal touch. When I look back to my own childhood, I remember making mince pies for Father Christmas on Christmas Eve and making messy chocolate truffles for my close family. These memories are special to me and I want to rekindle the magic. In this challenge, I will endeavour to make delicious, edible gifts for my family and friends, with my own hands. I hope that by taking the time and care to make homemade gifts, I’ll be able to make them extra special. It’s exciting to make homemade gifts, but I have to be very conscious of the costs as it’s easy to get carried away. There’s no point spending the money on ingredients, packaging and hours in the kitchen if it’s far cheaper to buy something from the shop! I will have to think up some savvy ideas to make sure my gifts are budget-friendly. It would be a shame to spend hours in the kitchen if the presentation is dire! I will be looking into easy, quick and cost effective ways to create wow-factor. I’ll also be considering the option of hampers. I’ve never made up a homemade hamper before, but it seems as though it might be a good idea for those I won’t see on Christmas Day. Gifts for my two boys and my niece are a must. Little wooden crates might work well for a child’s version of a hamper; I can’t wait to experiment! It will be fun to make treats for the youngest of our family. I’ve already got plans to make a ‘flat pack’ gingerbread house for my three-year-old niece as she’s very creative and will no doubt enjoy assembling and decorating it. This is what I plan to make. Together, these edible gifts will make stocking fillers for my husband and the boys as well as my niece, hampers for parents and in-laws and presents for boys’ teachers. I will also have cookie jars that I can take round to friends’ houses when I see them in the run up to Christmas, which should work out better value than a even a box of chocolates. Judging by my list, though, it does suggest that my family and friends may spend most of next year on a diet! Obviously, any chutneys, preserves and Christmas cakes can be made weeks in advance, so they will be my first port of call. The trickiest time will be the few days leading up to the big day. Some biscuits and chocolates don’t keep for long, so they will have to be made just before Christmas. This homemade Christmas challenge will definitely put me in the festive spirit. There will be chutney bubbling on the stove, gingerbread men to ice, fudge to stir and much, much more. I can’t wait for the smell of Christmas to fill our home as I bake up a storm. Of course, it’s also a great excuse to dig out the cheesy Christmas CD and have a singalong while I conjure up homemade gifts for my loved ones. I really can’t wait!